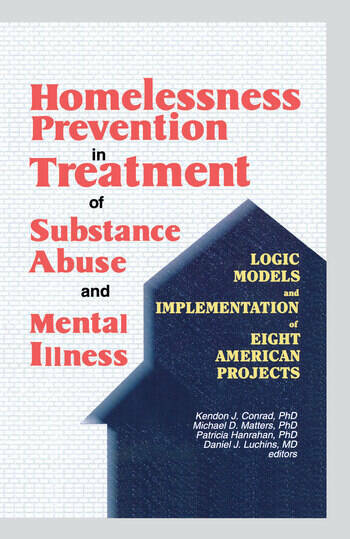 Through Homelessness Prevention in Treatment of Substance Abuse and Mental Illness: Logic Models and Implementation of Eight American Projects, psychiatrist, psychologists, and social workers will discover the results of eight, three-year long development projects funded by the Substance Abuse and Mental Health Services Administration (SAMHSA) designed to prevent homelessness in high- risk populations who have problems with alcoholism, drug abuse, and/or mental illness. Through this informative book, you will examine the theory or logic guiding each program, including an up-to-date review of the literature supporting each theory. You will also find a description of the implementation of the program as well as its history, the practical issues involved in delivering services, the pitfalls, lessons learned, and recommendations for the future so you can use the best ideas to implement in your own community and stop these individuals from reaching the streets. Homelessness Prevention in Treatment of Substance Abuse and Mental Illness provides you with new insights into how you can help your clients overcome political, economic, and environmental barriers to treatment that can lead to homelessness. This essential book will help you improve your services to your clients as well as give you step-by-step guide to implement these new programs in your community.